SAN FRANCISCO (Reuters) - A Google Inc commuter bus was blocked in San Francisco's Mission district for about a half hour Monday morning, highlighting many residents' growing concern that an influx of affluent technology workers is driving up costs in the city. "San Francisco, not for sale" and "Stop evictions now" numbered among the slogans yellow-vested protesters chanted as they surrounded the double-decker bus. Google's offices are in Mountain View, about 34 miles away from the incident. "The proposed policy balances the need to minimize impacts on Muni with the benefits that shuttles provide by taking thousands of cars off the street," Rose said. The agency plans to present the proposal to its board in January. If approved, a pilot test will go into affect in the summer, he added. "We certainly don't want to cause any inconvenience to San Francisco residents and we and others in our industry are working with SFMTA to agree on a policy on shuttles in the city," a Google spokeswoman said. "My shuttle came under siege this morning," tweeted Alejandro Villarreal, who attached a photo of the scene as it appeared through the bus window. Villarreal's LinkedIn profile identifies him as a program manager at Google. "Don't hate on me for my job," tweeted @FashionistaLab, whose Twitter description identifies her as a style editor at Google Shopping. "You think I LIKE commuting to Mountain View? This protest is dumb." "Google scum," read one notice pasted to a light controller at the corner of South Van Ness Street, a major artery for the commuter buses, photographed by local resident George Lipp on Sunday. "Keep catching your bus," read a notice on the other side of the light controller. The commuter-bus situation "has become very symbolic of what's happening to the city in terms of gentrification," said McElroy in a phone interview. "It's creating a system where San Francisco is being flooded with capital, and creating a technology class where other people can't compete." Heart of the City is planning a demonstration on Tuesday against a developer that plans to evict residents from rent-controlled apartments, she added. 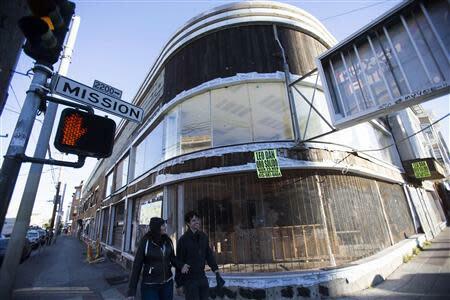 The total number of evictions jumped 25 percent to 1,716 in the 12 months ending in February 2013, according to a report by San Francisco's budget and legislative analyst, despite strong tenant-protection laws. 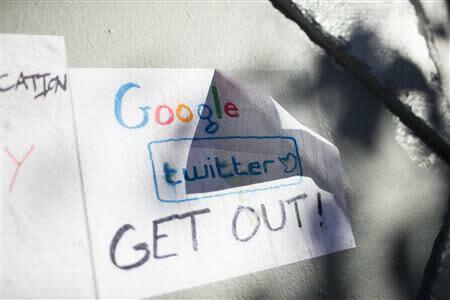 Last month, message service Twitter's IPO sparked a demonstration outside its headquarters.